Airstrikes in the Yemeni capital Sanaa have struck a funeral wake, killing more than 140 people according to the Houthi-run administration. A UN official in charge of humanitarian affairs in the country said more than 525 were injured. The Shi’ite rebels say Saudi-led warplanes were to blame but sources in the Arab coalition quickly denied any air role in the attack. “Absolutely no such operation took place at that target,” one said. Witnesses say a missile tore through a hall in the south of the city where senior Houthis were among the mourners for the father of the interior minister who had died. They described a scene of carnage, with charred or mutilated bodies strewn around. Ambulances raced to carry the wounded to hospitals, which sent out urgent appeals for blood. “The planes struck twice while they were at the wake. We don’t know how many victims there are but there are a lot of civilian casualties,” said one of those present, Salim Hadwan. Washington isn’t convinced by the Saudi denial: it says it may cut its support. Iran, Saudi Arabia’s main regional rival, called the attack a “horrific and inhuman crime”, calling for the resumption of peace talks. 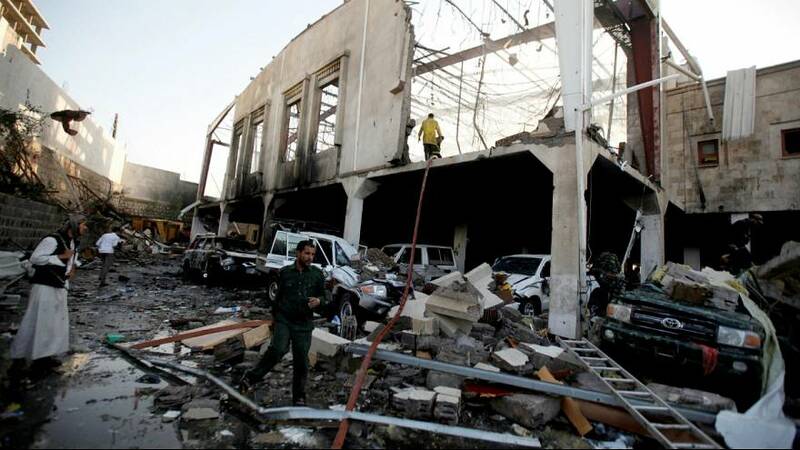 But one Saudi source reportedly said no coalition operation targeted the area. The number of dead made it the worst single atrocity since the Saudi-led alliance began military operations trying to restore President Abd-Rabbu Mansour Hadi to power since he was ousted by the Iran-backed Houthis. The coalition has been providing air support for Hadi’s forces in a civil war that has killed more than 10,000 people since March 2015 and displaced more than three million.